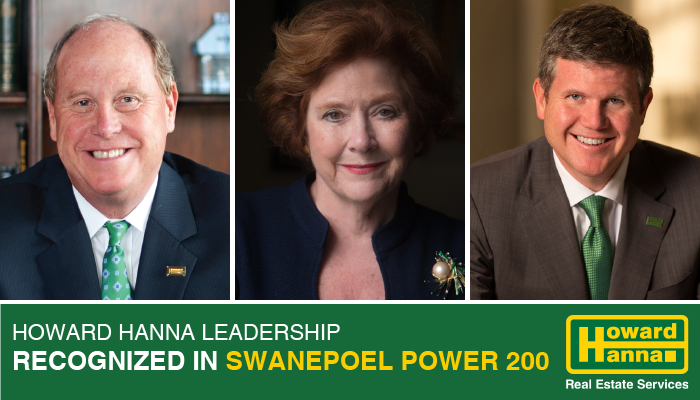 Pittsburgh, PA (January 15, 2019) – The 2019 Swanepoel Power 200 (SP200) report was released today with the rankings of the residential real estate industry’s 200 most powerful and influential leaders as of December 31, 2018. CEO Helen Hanna Casey and Chairman Howard W. “Hoddy” Hanna, III rank in the Top 10 most powerful people in the industry on the SP200. “These rankings measure the impact we have on the industry, the power of our brand, and strength of our company,” said Casey. In addition to the main power list, the SP200 also recognizes Women leaders. Helen Hanna Casey ranks #1 on the Top 20 Women Executives List, a list that acknowledges women leaders who hold the highest senior executive positions in the residential real estate brokerage industry. Howard W. “Hoby” Hanna, IV ranks 55th as the third generation executive who runs the real estate brokerage operations at the largest family-owned brokerage in the country. This is the sixth edition of the SP200, which is published by the real estate research and management consulting firmT3 Sixty each January. T3 Sixty analyzes over 3,000 industry CEOs, executives, and leaders to build each year’s list.